From 55 to 125 € the night I book ! 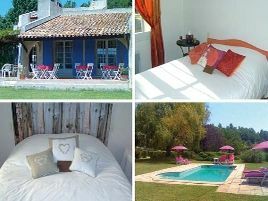 In the heart of Provence, near the picturesque Sainte-Victoire, a provençal-style house with superb views over the village of Rians. Swimming pool set in an acre of landscaped grounds. The elegant rooms, accessed from an interior patio, are cosy and peaceful. Michaël, a former pastry chef, brings a magic touch to both the breakfast table and lunch and evening meal. Warm and ready welcome..
1 family room and 4 rooms with bath or shower and WC. 50 to 70 euros (1 pers. ), 60 to 80 euros (2 pers. ), 100 to 110 euros (3 pers. ), 110 to 120 euros (4 pers.). Extra bed 20 euros. Baby equipment, children's meals. For teenagers: swimming pool, fitness room. Family room.